The Institute of Physics advances resource science with the help of its equipment. Nuclear magnetic resonance has found its use in two of the current four strategic academic units at KFU – EcoOil and Translational Medicine. 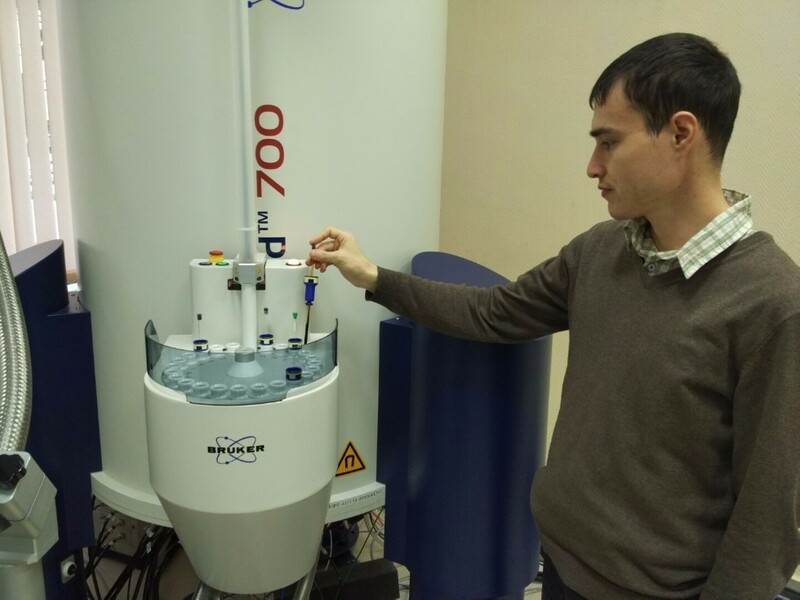 Chair of the Department of Medical Physics Albert Aganov explains, «NMR is mostly used by our department. We have been working with high-definition spectroscopy for a very long time now, since before the Department was established. The same is true for petroleum research – we have long-term contracts with petrochemical enterprises that have been in place for over 20 years. We now have much more capabilities because of the Competitiveness Program. And we are ready to face new tasks». EcoOil employees have big expectation about NMR. After all, it is the only method that gives both qualitative and quantitative measurements of hydrocarbon structure. Head of SAU EcoOil Mikhail Varfolomeev elaborates, «As you might have heard, we are trying to implement in-situ refining technologies for viscous and heavy oils, and we need unique experimental methods for such measurements. Together with already existing methods, such as tomography and fractionation, NMR is also very promising. We can determine what really happens during that so-called refining, do we really get light hydrocarbons or there are other processes involved, such the formation of unsaturated compounds that are detrimental to the oil refining process. NMR helps us glance into the refining process and correct it». NMR use is not limited to only that, though. NMR-Structure Lab has already tested its capabilities on real oil specimens, and with some success. This is what Leading Research Associate of the Lab Vladimir Klochkov had to say, «We had two different specimens from two deposits. Both are viscous oils, but they were distracted differently – by traditional means and by steam-assisted gravity drainage. We had to find out whether steam affects the quality of oil. As it turned out, one of the specimens contained four times more water than the other. Then a more complicated task arose – to determine the reason of viscosity. It can be because of naphthyl groups or because of olefins. Thus we can evaluate the quality of oil and decide whether it’s worth refining». Dr. Klochkov heads a special task force that works on oil and petroleum products as well as medications. Several young colleagues have joined him, and this is a step forward in their careers.